Ideal gifts for students, jogger, elderly, kids, women, night workers. Our new personal alarm is designed to be your safety companion 24 hours a day, regardless your location, come in handy anywhere you need it. 1. PLEASE keep your hand on your ear to avoid tympanic membrane injury when testing the personal alarm sound. 2. PLEASE DO NOT aim the self defense keychain at your eyes when testing the LED light. 3. PLEASE keep the security alarm dry instead of putting it in water because it is not absolutely waterproof. 4. PLEASE keep it away from children that under 7 yrs old. DO NOT allow to be used it as a toy. 5. PLEASE remove screws from back cover and replace new batteries when the personal alarm sound goes low. 【 130dB Loud Sound + Mini Flashlight 】The personal self defence security alarm keychain is designed to produce a loud 130dB sound that helps call for assistance in an emergency and helps deter attacker. It is also come with a mini flashlight for night lighting and finding the keyhole. 【 EASY TO USE 】You can easily activate this personal alarm system by pull out the pin and it release a loud, attention-calling shriek. Insert pin back in and you can stop the sound. This will definitely scare your attacker and call others to help you. 【 EASY TO CARRY 】This personal alarm security keychain is small and portable, can be attached on ladies bag, schoolbag, briefcase, mountaineering bag, backpack, belt loops, suitcases, keys, dog Leash. 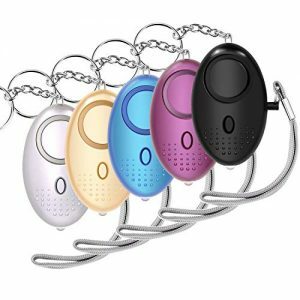 【 BROAD APPLICATION 】The personal alarm is perfect for all ages: Students, Elderly, Kids, Women, Joggers, Night Worker etc.. It's also a security necessity for traveling, hiking, camping come across dangerous situation and need others help. 【 WHAT YOU GET 】Package includes 1 x gold personal alarm, 1 x silver personal alarm, 1 x black personal alarm, 1 x blue personal alarm, 1 x purple personal alarm, 1 x Instruction manual and 12-month warranty and friendly customer service.